Mistakes are a part of life, but we can benefit from our mistakes and make the most of them, or we can run from them pretending they never happened. Forbes published an article on how the smartest people convert mistakes and obstacles into opportunities. You are going to find out eventually what people liked about your idea, and what they didn’t like. It’s better to learn sooner rather than later the good and bad about your product, before you sink any more money and/or resources into the idea. The feedback and market reaction could take you in a different direction or it could serve as a barrier to your competitors. Brown provides the example of an entrepreneur thinking of opening a restaurant, but a survey told him potential customers thought the area was already saturated. However, a few of said they would love a place that had a ready-to-go take out to heat up at home. Since the entrepreneur was able to get feedback before opening the restaurant, he was able to avoid a mistake. The feedback you receive provides you with evidence to get you ahead of the game. If someone else is thinking about doing something, such as opening a restaurant, you know something they don’t. For instance, take a look at Coca-Cola. Pharmacist John Pemberton was trying to come up with a headache cure and general pain reliever. He began work on beverage combining coca leaves and cola nuts, but when his lab assistant accidentally mixed the concoction with carbonated water; the two men tasted it, liked it, and decided they might make a profit on it. They invented the beverage that became known to the world as Coca-Cola in a backyard kettle. In other words, they turned their mistake into a profitable opportunity. Another example is when Chrysler rebranded the Sebring as the Chrysler 200. Chrysler was considered the U.S. automobile company most likely to collapse. They remained silent while Ford and GM tried to restore their images. They knew their ad needed to be different; something special that would make customers believe in Chrysler again and show they had a new and improved product. They delivered in the 2011 Super Bowl ad. They offered something gritty, dark, and full of attitude. The ad is as much about Detroit as it is about the Chrysler 200. Their “Imported from Detroit” slogan resonated with an American audience who understood the trials of economic hardships. The ad gave people hope and Chrysler made the most of it. Chrysler saw some of its best sales months in 2011 since 2007. 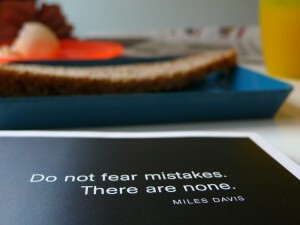 We all make mistakes, but to move forward, we must learn from them. Take a page from the playbooks of Coca-Cola and Chrysler, and turn your mistakes into opportunities. What’s the worst mistake you’ve made? Did you turn it into an opportunity?